A henge in nickname only, this one is included in honour of tomorrow, which is Thanksgiving in the States. Maize, or corn as its called in English-speaking America, is a traditional Thanksgiving food. 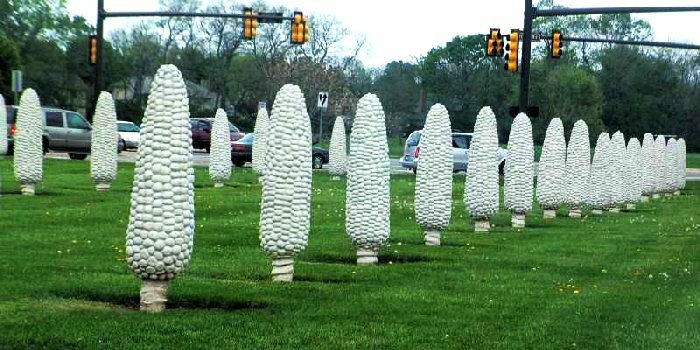 Referred to jokingly by locals as Cornhenge, this monument may seem inexplicable, but here’s some ‘splainin‘. And here’s a brighter picture of it on Flickr. As a Stonehenge replica, this can’t rate more than 3 druids, but as a piece of eccentric pseudo-megalithia, if we may coin a term, we think it rates pretty well. Oh, and happy Thanksgiving to those who celebrate. Don’t forget to make a henge with your leftovers and send us a picture!